• What Stress is, a characteristically an easy yet abstract topic? • What’s the mind-body connection of stress? • What heart rate variability is and why it is an objective measurement? • How emotions and stress affect heart rate variability? 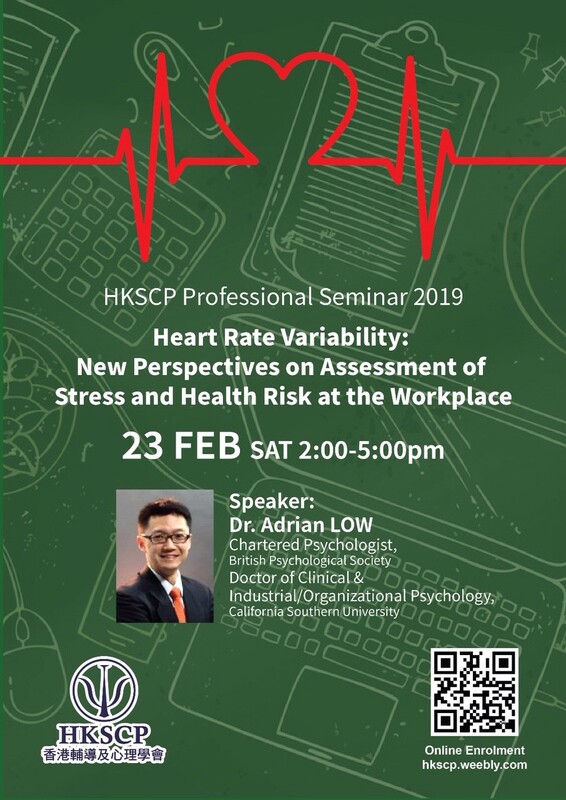 Dr. Adrian Low is a chartered psychologist (British Psychological Society) that has graduated with a Doctor of Clinical & Industrial/Organizational Psychology from California Southern University in the USA. He also holds a master’s degree in Education from The Chinese University of Hong Kong. Dr Low’s workplace stress research has won the presidential award for doctoral research excellence at the California Southern University and since then he has been invited to be a keynote speaker in many conferences worldwide. Adrian is the president of the Hong Kong Association of Psychology, an NGO. Besides that, he is an adjunct faculty member at the University of Worcester as well as an adjunct lecturer at the HKU (university of Hong Kong) School of Professional and Continuing Education.